Oceania V, with it's sister building, Oceania IV, comprise the Oceania Island development which feature it separate guarded entrance, amenities and pool deck, tennis courts and marina with over thirty boat slips. 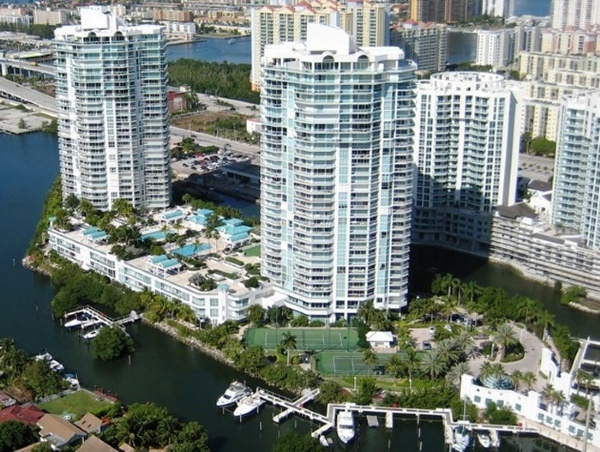 Oceania 4 Sunny Isles Beach is a private and luxurious island community on the Intracoastal, just steps from the ocean. Three story villa, two story penthouses and one, two and three bedroom tower residences. Amenities include private beach club, ocean front spa, Tennis, marina and much more. Built in 1995, the Oceania Four condominium offers two, three and four bedroom apartments ranging in size from 1,530 to 4,270 sq ft and is available for immediate occupancy. The Oceania 5 has an incredible location, expansive views and year-round bay breezes. plus it is just minutes from all the amenities Miami has to offer. In the cool shelter of Florida's Intracoastal Waterway, overlooking the tranquil blue waters of the Atlantic, there resides a community of individuals who live along the water's edge. Each is vastly different from the next, yet they are united by the sheer joy of life in their private community on the Gold coast. You're invited to step into this world of casual elegance and country club amenities. Where friendly staff members know your name. Neighbours care about each other. And residents delight in the luxury of waterfront living. You're invited to make your home at Oceania's newest property - Oceania Island. Oceania's variety of social functions is one of many reasons it is voted Best Overall Community in South Florida year after year. As a resident, you can meet and mingle with your neighbours and friends. View a newly released film shown on the Club Cafe's big screen. Or enjoy fun in the sun at a beach Bar-B-Que. Whichever you choose, your social calendar is certain to fill up fast. When you finally find a moment to relax, sip a frozen drink on the beach. Or have a casual lunch at one of two waterfront cafes. As the day's activities shift to an evening of entertainment, attend a black-tie event or enjoy the international cuisine and elegant atmosphere of your private oceanfront restaurant. If you're entertaining for the evening, private party rooms are available with exquisite cuisine prepared by our executive chef.